This is one experiment which all mobile phone users should love. Google had just launched a new experimental game with Chrome. 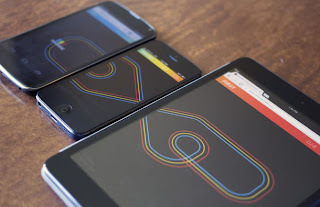 Called the Racer, it uses the Google Chrome so no matter if you are using Android or iOS you can play this racing game involving multiple devices. Google displayed this game yesterday at Google I/O in order to showcase the Chrome's ability sync the Android and iOS devices together. And sure it did! The aim of the game is to control the tiny cars on the track created on separate phones which become one when brought together. The above pic shows three phone interconnecting the tracks but you can connect up to five devices together to run Racer. And to play this game you just need Chrome Browser installed on all the phones or tablets. If you are interested to check out the new Google experiment go g.co/racer with your mobile devices and follow the instructions to set the game up. You only need to control these cars when they appear on your device’s screen. Touch the screen to accelerate and release the brake. You will require a bit of practice before can get hold of the controls. This in fact is a decent experiment where one can just start the game within a browser and play with his or her friends. Chrome users will also like its earlier arcade style game called the Super Sync Sports. The browser based games are a future which up to now has not been fully exploited. So go play this one! Google Play is already giving unlimited songs to its US users and with the Google Play Games hub coming soon, we have plenty to look forward to this summer! Meanwhile you can visit here to find out all the latest games for all kinds of phones!